His Highness Sheikh Mohammed bin Rashid Al Maktoum, Vice President and Prime Minister of the UAE and Ruler of Dubai, has visited the Halal World Food Exhibition, being held for the first time on the sidelines of the 19th edition of the Gulf Food Exhibition (Gulfood). He was accompanied by Sheikh Hamdan bin Mohammed bin Rashid Al Maktoum, Crown Prince of Dubai, and Sheikh Maktoum bin Mohammed bin Rashid Al Maktoum, Deputy Ruler of Dubai. Sheikh Mohammed toured the pavilions of the Halal World Food Exhibition, where he was briefed on the latest Halal food products from featured exhibitors. Hilal Saeed Al Marri, CEO of the Dubai World Trade Centre, which is organising the event, briefed Sheikh Mohammed and the audience that Halal World Food is a specialised platform attended by hundreds of international companies that specialise in this vital sector, important for more than a billion Muslims around the world. Al Marri pointed out that the new event, “World Halal Food”, is a gateway for investors to enter into production, processing and distribution of Halal food sector, noting that the event is expected to become known as the largest international annual trade show for Halal food. 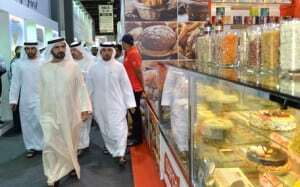 He said that the World Hall Food Exhibition has been organised for the first time within the plan of Dubai to develop the economic sector of the Islamic economy, as outlined by Sheikh Mohammed bin Rashid, to make Dubai the capital of Islamic economy, Islamic finance sector and annual Halal food exhibition hub. Among others accompanying Sheikh Mohammed were Mohammed bin Abdullah Al Gargawi, Minister for Cabinet Affairs, Chairman of the Higher Committee for Development of the Islamic Economy, Khalifa Seed Suleiman, Director-General of Protocol and Hospitality Department in Dubai, and other officials. With exhibitors from six continents displaying thousands of Halal products – from energy drinks, vegan and vegetarian foods to meat and poultry, canned goods, gourmet and fine foods – Halal World Food will instantly establish a market-leading position as the world’s biggest annual Halal food sourcing trade show.